Exports to Iran stand at only around 1 percent of Russian foreign trade, but a trade surplus and the existence of a large market for Russian manufactured goods make Iran an important partner. With all the expectations that Russian businesses had about Iran after the lifting of American sanctions, the 60 percent growth in Russia-Iran bilateral trade from $1.2 billion in 2015 to almost $2 billion in 2016 can hardly be termed a breakthrough. However, the resumption of weapons deliveries, as well as participation in infrastructure projects financed by Russian loans, led to the doubling of exports of non-energy products from Russia to Iran. These exports mainly comprised of weapons, trucks and wagons. Since the early 2000s, the trade turnover between Iran and Russia grew steadily and reached its peak in 2010-11 to $3.7 billion, of which Russian exports accounted for $3.4 billion. After 2012, when the U.S. imposed new sanctions against Iran, the country was disconnected from the SWIFT interbank payment system, and Russian businesses began to experience problems when it came to making financial settlements with Iranian partners. The sanctions led to a large increase of the cost of doing business, which in turn led to an almost threefold drop in bilateral trade to $1.25 billion in 2015. The largest volume of export from Russia at the time of the imposition of sanctions came from steel industry products. To solve the problem with access to foreign currency, Russian steel manufacturers appointed international traders as intermediaries, giving them a share of the profits. Why did the Russian deputy prime minister abruptly cancel a visit to Iran? Another method to bypass the sanctions was bills of exchange, but this caused delays. An additional challenge was posed by a special declaration procedure: international bodies demanded proof that the goods were not used for military purposes. Another mechanism was doing business through representative offices of Iranian banks in CIS countries. Specifically to service trade operations between Russia and Iran, Mir Business Bank opened offices in Moscow and Astrakhan. The bank is completely owned by the largest commercial retail bank in Iran – Bank Melli Iran. One of the clients of the bank is the Ashinsky metallurgical plant. Under the sanctions regime, the bank did not use the SWIFT system. Instead, the Iranians deposited rials in the bank, which converted them into rubles. Similar financial transactions were processed by Tedjarati Iran bank in Tajikistan and TK Bank in Belarus. After the lifting of sanctions there were no longer any payment-related problems. Moreover, in 2016 Russia and Iran signed MoUs on dozens of industrial projects, the total amount of which may reach $40 billion. However most of these projects are still on paper. Generally, agreements between major Russian and Iranian businesses are achieved at a high level with the participation of representatives of ministries. These projects, however, depend on additional funding. Most Iranian companies are short of money, which means that their Russian counterparts have to find the finances for each project. Since Russia is also experiencing a credit crunch, only a small part of the projects receives government loans. It is these projects that become solid contracts. This was the case with the construction of a power plant in Bandar Abbas and with the supply of wagons by Uralvagonzavod. The latter was financed by Russia’s Vnesheconombank. Since the mid-2000s, the largest chunk of Russian exports to Iran comprised of products of steel industry products. In particular, Magnitogorsk Metallurgical Combine and Severstal actively worked in the Iranian market. Anti-Iranian sanctions made the business less profitable, and Iran actively started increasing domestic steel production. As a result, Russian steel companies have a significantly reduced presence in the country. Against this background, in 2014, Russia commenced significant grain exports to Iran. Despite the fact that many experts rated this product as risky, by 2016, Iran was among the top five importers of Russian grain. The importance of this sector may be reflected by the fact that in 2016, Rusagrotrans, the largest Russian operator in the field of grain transportation, jointly with Azerbaijan Railways, created the AzRusTrans company for the purpose of grain delivery to Iran and Turkey. The company also plans to build a grain terminal with an initial capacity of around 30,000 tons per year on the Azerbaijan-Iran border. Export-import operations between Iran and Russia are mainly carried by large businesses with a significant share of state participation. This resulted in a sharp decline in trade after the imposition of sanctions against Iran, as large companies became more vulnerable to financial constraints. But the very same factor also became the basis of positive dynamics last year. The growth of trade turnover between Russia and Iran in 2016 was both quantitative and qualitative. Machinery has replaced agricultural products as the largest source of exports to Iran, accounting for 60 percent of Russian exports to the country last year. 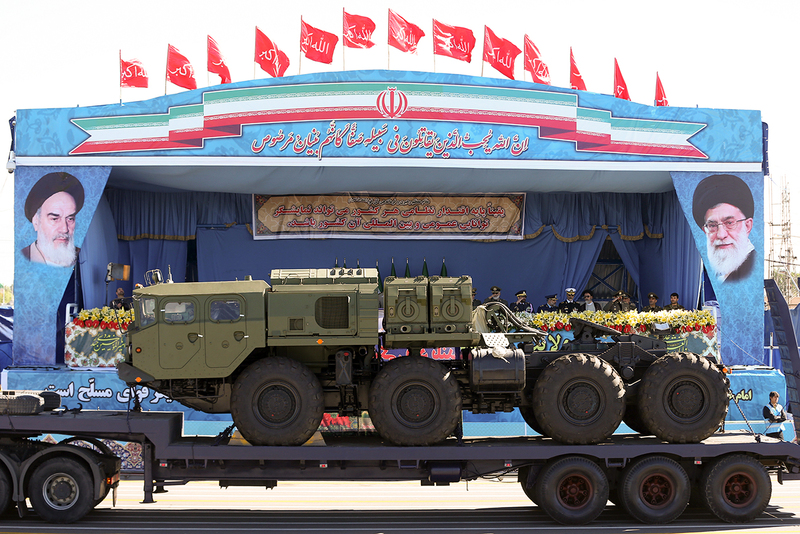 One of the main reasons for the overall growth in Russian exports was the return to the Iranian market of the so-called “secret code” exports, which primarily comprises of weapons. The largest example was the supply of the S-300 anti-aircraft missile systems. The first batch of S-300 was delivered in April 2016. The executor of the $900 million contract was the Almaz-Antey company. According to RBC, the total volume of supply of products under the "secret code" to the Islamic Republic in 2016 was more than $300 million. Under sanctions, this figure did not exceed a few million dollars. In addition, Russia agreed to provide Iran with a loan of $2.2 billion for infrastructure projects involving Russian companies. This includes the construction of a power plant in Bandar Abbas, the completion of the Rasht–Astara railway, as well as the electrification of the Garmsar–Inche Burun railway. In addition, the main manufacturer of wagons in Russia, Uralvagonzavod won the contract for the supply of 5,000 wagons, the first batch of which was shipped in September 2016. The share of engineering products in Russia's exports to Iran may increase even further. Russian truck manufacturer Kamaz plans to export 300 trucks in 2017, GAZ signed a memorandum with the Iranian authorities for the supply of 900 buses. After the lifting of sanctions a number of Russian companies became interested in Iran. Investment Fund Winter Capital Partners, owned by Russian billionaire Vladimir Potanin, became a co-owner of a number of Iranian Internet companies, including the country's largest online retailer Digikala. According to Kommersant, the investment in Digikala is estimated at $300 million. This deal was the first significant acquisition by a Russian company in the Iranian IT sector. Another new trend is cooperation in the field of production of medicines. In 2016 one of the largest Iranian pharmaceutical companies Sobhan Recombinant Protein and the Russian Petrovax Pharm signed agreements providing for the production of vaccines against influenza in Iran using Russian technology. In another case of cooperation in the pharmaceutical industry, hepatitis B vaccine for Iran will be produced in Russia. There is also some progress in the field of tourism. Moscow and Tehran signed an agreement on the mutual simplification of visa procedures. This along with the devaluation of the ruble led to a 170 percent increase in the number of Iranian tourists visiting Russia in 2016. The actual number was however, less than 100,000, so this may not be a major indicator. A key challenge for the expansion of economic cooperation between Russia and Iran is that the countries are able to offer each other a limited number of products at globally competitive rates. Russia’s traditional exports to Iran include metals, wood, electrical machines, paper and cardboard, floating structures, grain, weapons, and individual mechanically engineered products. Russia’s major import from Iran is agricultural produce. In 2014, more than 81 percent of Iranian exports to Russia comprised of vegetables and fruits. Starting in 2015, Iran began to export fish and seafood to Russia. In addition, in 2016, Russia imported more than 1 million tons of dairy products from the Middle Eastern country. In a sanction-free environment, Russia will continue to increase its presence in the lucrative Iranian market.